This paper focuses on estimating the rare event of overflow in the downstream queue of a Jacksonian two-node tandem queue, relying on importance sampling. It is known that in this setting ‘traditional’ state-independent schemes perform poorly. More sophisticated state-dependent schemes yield asymptotic efficiency. Their drawback, however, is that they require a per-state computation of the new measure, so that it still consumes considerable machine time. The contribution of this paper is a scheme that combines asymptotic efficiency with low complexity. It retains the quality of the original state-dependent scheme, but its implementation is almost as simple as for state-independent analogues. Miretskiy, D.I, Mandjes, M.R.H, & Scheinhardt, W.R.W. (2008). Rare-event simulation for tandem queues: a simple and efficient importance sampling scheme. CWI. 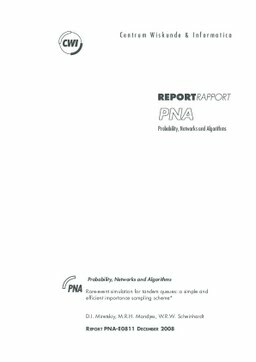 Probability, Networks and Algorithms [PNA]. CWI.